Many home machinists with limited budgets have made a poor man’s DRO by mounting inexpensive digital calipers or scales on their mini-mills. They seem to work pretty well, but their displays are small and they tend to get mounted where they will be hard to read and their buttons hard to push. Now there’s another affordable option. 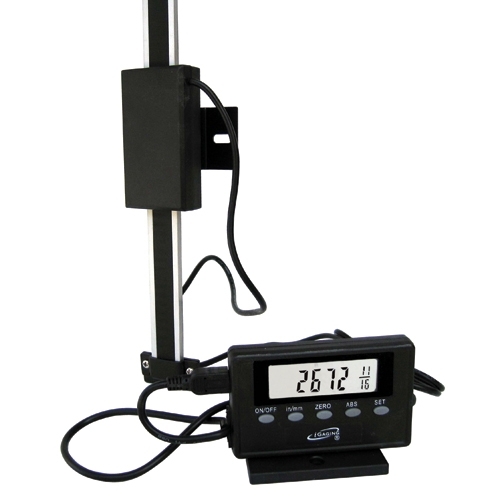 You can buy inexpensive scales with remote readouts and controls. The scales are available in different lengths and come with mounting hardware and a large easy-to-read display at the end of a 50-inch cord. I think if you shop around for the best price you’ll probably be able to add them to all three-axes of a mini-mill for about $125 or less. I haven’t had a chance to play with one of these things yet and I’d like to know your opinion of them if you have. One concern I have is that they are still battery powered, although there’s probably a solution for that. They also only have a resolution of one-thousandths (.001). In most cases that’s probably enough, but I sometimes wish the DRO I made for my mini-lathe had a resolution of at least one-ten-thousandths (.0001). I installed these on my LMS X2 minimill, works great. Faster setup, return to position , repeatability is great. Took my time mounting out of the way of chips making lower profile brackets. Batteries seem to last long time but no auto off, so cant forget to turn them off. Would recommend.